Who’s ready for the next round of scrappy blocks of the month? Definitely me - since I’m actually prepared this year! Last year, I randomly decided to do Fruit Salad halfway through January, and winged most of the blocks as the year went on. It was still a great quilt, but the blocks weren’t a consistent size, and it was a bit stressful trying to get it together each month and at the end. Not this year! This year, I have everything planned and ready to go. I’ll be posting on the first Monday of every month as part of BOMs Away. The block will be free for a month until the next one posts - but don’t be too upset if you miss one. A portion of the proceeds will be donated to the Hopatong Community Garden, so you’ll be helping a great cause run by one of my good friends. Get the printer-friendly instructions here! I’m using a variety of Kona browns for the background fabric this time, and I used two different greens for the leaves because I know I’ll be using the extras elsewhere throughout the months. I also use the Quilt in a Day triangle ruler to trim my half square triangles. Here it is, the finale to my scrappy block of the month! Since I was winging it, a layout was a bit more challenging - some of the blocks were 18”, some were 16”, one was 10”… I finally got them finagled into place, with a couple filler blocks, and got the whole thing together. And I just love it. I mean, I knew I was going to, but the bias binding sets off the white so perfectly and all the scraps just shine. I love it. LOVE. So do you want to love it, too? Get the printer-friendly layout here! This is the cutting instructions for the sashing and filler blocks, and the layout for the full quilt, but not all the fruit blocks. You can find those here. The layout instructions and fruit blocks will be free until the end of January, then they will be bundled together in a full pattern. I needed 1.25 yards of Kona white to do the sashing, if you’re using the same throughout. Or go scrappy! For Veggie Patch, I’m using a variety of Kona browns for the sashing and background fabric. Oh, you want a sneak peek of this year’s Veggie Patch? Fine, if you insist! Look for way more info about Veggie Patch on Monday, when the first block is released. Save those leftover scrap bits from Fruit Salad! But first, finish up your Fruit Salad! If you’re making this quilt, please use #fruitsaladquilt on Instagram or comment here so I can find your blog! This year has been…unexpected. Not in a bad way - not at all! But all the things I thought were my goals at the beginning of 2018, ended up not. The things that did end up happening were generally much better than I had planned, so…screw planning! Let’s just wing it in 2019! I unexpectedly ran my own scrappy Block of the Month (and planned the next two years’ out!) I unexpectedly made time to write my own patterns - mainly because I had to do the graphics for the BOM, so might as well keep going, right? I unexpectedly had more longarm business than I thought would happen right off the bat, which meant I eased back on the t-shirt quilts. I unexpectedly had a few commission quilts, one of which turned into my first pattern, Oklahoma, and the idea of more scrappy state quilts. And I unexpectedly took over the southwest OK district for Quilts of Valor, which I have so many plans for! I launched a block drive, and starting this month, I’ll be out talking to guilds and repping QOV at our little local quilt shows, as well as doing quilt assembly and veteran presentations. So the unexpected has been good. Very good. And I’m just going to keep rolling with it! So, what did the unexpected accomplish in 2018? Charm Dash - buy the printer-friendly version here. Charm Dash was in my sketchbook forever, and in the fall, I finally wrote it out, got some pattern testers, and went for it. And Oklahoma - buy the printer-friendly version here. I love this quilt and have SUCH BIG PLANS for the rest of the United States! Stay tuned because I’ll need some testers. 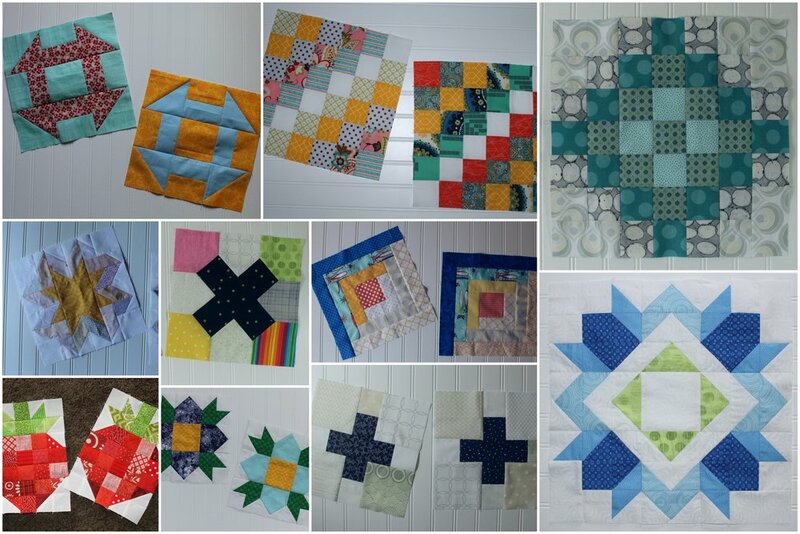 And finally, the ones that started it all The Fruit Salad blocks - and the layout is ready to go on Friday! I love how it came out, and I’ve had so much fun planning and prepping this year’s scrappy edition, the Vegetable Patch. First block for that one goes out on Monday! Seven mini projects - mostly gifts for others, but a couple to brighten up my sewing room. I loved my block of the month! So much fun to make and mail these blocks every month, even the ones I ended up hating. It was a great exercise in color and piecing. I’m sad that it won’t be continuing in 2019! Fewer t-shirt quilts this year, as I made room for quilt commissions and pattern writing. But some new challenges this year - including using “paper” (scanned and printed onto fabric), a shopping bag, and that red dress! And finally, Quilts of Valor. I actually only made one top (mailed to my Washington chapter before I found out I was in charge of this one) and one quilt, awarded in November. But - I made demo blocks for my block drive, got a bunch of blocks (and tops!) from locals and Instagram, made blocks for another chapter’s block drive, and the book (in which I represent Washington) was released! Plus all the behind-the-scenes planning that you’ll see more of this year. So, in all? A good year. I’m happy to have these accomplishments in the books. And I’m looking forward to another year of the same. The last quilt of the year, and it’s a gorgeous memory for a sibling! Not mine, but a friend of my parents’. I know the friends, but not the sibling. But after resizing 90+ family photos, I’m pretty sure I know the sibling pretty well by now! The client contacted me fairly soon after I finished Worked for Success - when I learned to print documents and photos on Spoonflower fabric. So I was able to say YES immediately, because I knew how to do this! 92 photos! I split them in folders, horizontal and vertical, and resized them so they would come out approximately 7” on the longest side. Then everything was set with a 1” strip in between and 2” sashing strips. I measured and added some wider strips on the tops and bottoms of some rows so they all came out the same length. That made it extra collage-y! The vast majority of the pictures printed exceptionally well on fabric. The pinkish one on the lower right hand size was even a picture of a scrapbook page, and it came out great! This was a really fun memory quilt to be a part of - and just goes to show, not all memories are t-shirts! See also: Whoop Whoop, TGIFF, Needle & Thread Thursday, Finished or Not Friday, Show Off Saturday, Let’s Bee Social, Midweek Makers, Oh Scrap!